Get to know more about DVD copy protection software, related encryption technologies and how to copy a protected DVD from Disney and other film publishers. Q: Help! DVD copy protection software. Where can I download a free DVD copy software that can put copyright protection in videos I put in DVD so those people non-savvy in Tech gadgets and software can't copy them? It's a little amateur business for me, and I would really appreciate your help!!! How to Fast Rip Copy Protected DVDs without Qulity Loss? WinX DVD Ripper Platinum/for Mac - No. 1 fast DVD ripping software, that allows you remove any DVD encryption technologies, like DVD CSS, DVD Region Code Enhanced, Sony ArccOS, UOPs, APS and even Disney X-project DRM, and convert DVD to nearly all mainstream video/audio formats and potable devices, such as MP4, AVI, M4V, FLV, iPhone, iPad, Andorid, PS4, Xbox, Chromecast, while delivering 3x-5x ripping speed than any other DVD rippers in the market. Just get it free to have a stunning try now! UOP (full name Advanced Regional Copy Control Operating Solution): A copy-protection system designed as an additional layer to be used in conjunction with CSS. The system deliberately creates corrupted sectors on the DVD, which cause error to DVD copy software's working. Disney Fake (also named Disney X-project DRM): It's a relatively newer DVD copy protection from Walt Disney Picture that's quite worth mentioning. Movie DVD encrypted by Disney Fake has 99 titles at most and the VOB movie file size can be over 40GB, which will cause the DVD ripping process crash or just get disordered/crumbled movie video if you are using general DVD ripping software. >> How to Rip Disney DVDs? RipGuard and ACP (from Rovi Corporation/Macrovision): Those are two products, protecting DVD from being pirated. RipGuard tech aims to stop DVD ripping by changing its content format. Bad news is that AnyDVD and DVDFab can bypass it. While ACP (analog copy protection) insets a battery of excessive voltage pulses with off-screen VBI lines to the video, causing changes in the video image's brightness, making the DVD unpleasant to view. Luckily too, DVD Decrypter can circumvent both RipGuard and ACP. Moreover, there are also some other emerging DVD copy protection techs like AACS (advanced access content system) used introduced to Bru-ray and HD-DVD. Unquestionably, DVD copy protection will take time to sharpen the saw. Here a continuously updated DVD ripper is so necessary. Why Copy Protection Is So Crucial for DVD? * For home-made DVDs: If you've made a DVD out of movie(s) shot at special day or occasion, and wanna put/add a protection on it for sale/business or so, DVD copy protection software is a must-have. Because it helps encrypt your DVD to prevent it from being copied, or make it harder and even impossible to be copied for unauthorised usage, like passing it around to each other, that may will have on your revenues. * For commercial DVDs: Compared to the home-made DVD copy protection, commercial one is more complicated. DVD producers use analogue and digital protection on disc copy protection to reduce/impact unauthorized copying. Although the movie DVD producers have tried to stop users coping their films, and spent millions on it as well, some free or small priced software out there can bypass it. So honestly recommend you a tool/copy protection removal software - WinX DVD Ripper Platinum, with which you wouldn't bother with encrypted DVDs' copying and backup any more. It can defeat DVD CSS, region code, RCE, Sony ArccOS, UOPs and even Disney X-project DRM at the DVD ripping process. Better still, this copy protection removal software is being continuously updated to settle all DVD copying/backup matters of any new copy protected DVDs. How to Copy a Protected DVD on Your Windows PC/Mac OS X? There comes out many newly released movie DVDs, WinX DVD Copy Protection Removal Software works perfect on ripping DVD The Gunman, Chappie, Kingsman: The Secret Service, The SpongeBob Movie: Sponge Out of Water, McFarland, USA, Jupiter Ascending, Taken 3, Fifty Shades of Grey, The Wedding Ringer, The Hobbit 3, The Gambler etc. Here we take ripping/copying classic Disney film - Frozen - on Windows 10 for example to show you how to rip a copy protected DVD with WinX DVD Copy Protection Removal Software. Put DVD to DVD-ROM drive, launch WinX DVD Riper Platinum, and click "DVD Disc" icon on the top toolbar to select and load DVD content. You may find ISO Image and DVD Folder options here, because they two are also supported formats. You can choose whatever format/device you like or need among the 320+ different output formats and 350+ device profiles, e.g MP4, AVI, WMV, MOV, FLV, iPhone, iPad, Android, PS4, Chromecast, music, TS video. If you just wanna copy this protected DVD without quality loss at all, just choose one way in "DVD Backup" profile, like "Main Title Copy" and "Full Title Copy". Speaking of protected movie title, WinX DVD Ripper Platinum can recognize and choose the real one by default. Here Title 1 is the right title of Frozen DVD. Subtitle and audio channel are free to select. You can add external SRT subtitle to movie video. Embedded with a video editor, it enables you to adjust audio volume, crop/trim video. At the bottom of the interface, you can click "Browse" to select the path to save ripped movie video. While under the preview box, there are four options for getting DVD copied stably with high quality. When all preparations done, press blue "RUN" botton to begin copying protected DVD of Frozen. WinX DVD Ripper Platinum, known as No.1 fast DVD ripper software, can convert feature-length in about half an hour. Note that the free trial version can just rip DVD content in 5 minutes at most. So if this program is palatable to you, just buy it right away to copy your protected DVDs at once! * We only advocates ripping/copying protected DVDs for personal use only and suggests referring to the DVD copyright laws in your countries before doing so. 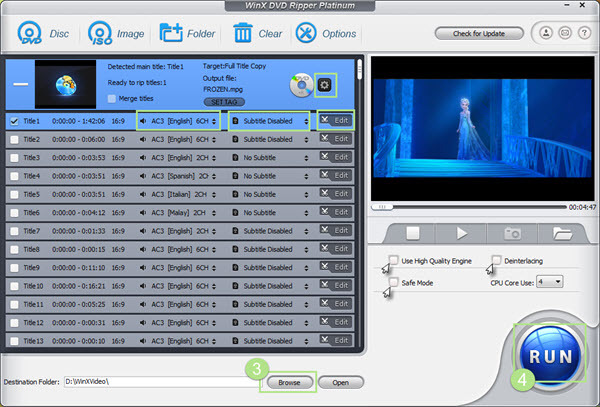 WinX DVD Copy Pro - All-in-one solution to designed to satisfy all of your DVD backup/copyiny requirments, which can remove DVD region code/UOPs/CSS encryption and check Disney's Fake first, and then clone protected DVD to DVD disc, DVD to ISO image file, DVD to Video_TS folder; copy DVD to a single MPEG2 file, copy DVD chapter, extract video/audio from DVD. 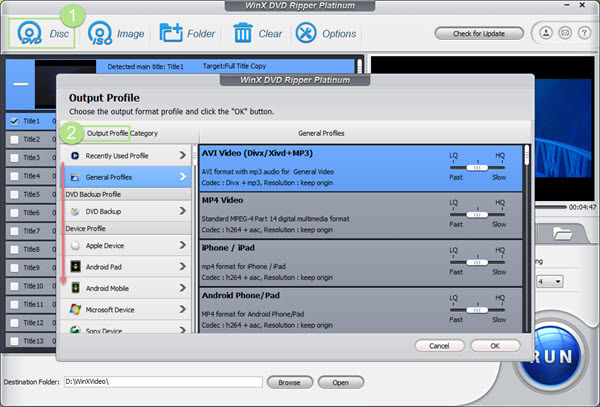 Better still, WinX DVD Copy Pro can also act as ISO Mounter and DVD Burner tools. How-To: Rip Copy Protected/Copyrighted DVD to Hard Drive as MP4 etc.